The OCARC held its yearly holiday dinner at Jägerhaus Restaurant. Great food, Great friends, Great prizes. This was an event you never want to miss. It was held at the same place we hold our monthly breakfasts. Our current President Nicholas - AF6CF turned the gavel over to Kristin - K6PEQ, our new President. He also presented the 2009 Good of the Club Award. this year was a tie and dual awards were presented to Kris - KC6TOD and Chip - K7JA. Congratulations to you both! Gordon West - WB6NOA spoke at our November general meeting. Gordon always brings a lot of knowledge and excitement for our great hobby when he speaks. Club elections for the 2010 year were held. Results are available here. The PEQ's are once again hosted the Pot-Luck party. This year it was held on All Hallow's Eve, and many members showed up in costume. The party started at 1 PM. The annual club auction was held at our regular meeting time and place. Auctioneer Chip Margelli - K7JA, with his Heil sound system, led the proceedings. Numerous items of electronic nature were auctioned off and a lot of one person's junk became another person's treasure! Bob Grimmick - N6OX was our guest speaker at the September general meeting. 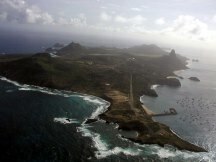 Bob talked on the ZYØF DX-pedition to Fernando de Noronha that took place in June of 2009. Brian Thorson - AF6NA of Southern California Edison spoke at our August meeting. Brian works for SoCal Edison and is an expert on Electro-Magnetic Interference. His presentation demonstrated and discussed sources of radio and TV interference including ordinary appliances we use everyday as well as noise from power lines. He also talked on techniques to find the source of such noise. A one-day event that replaced the usual three-day Southwest Division Convention was held at the Earl Warren Showgrounds in Santa Barbara, CA. Numerous club members made the trek to Santa Barbara to attend. The Orange County Fair ran from July 10 through August 9 of 2009 at the Costa Mesa Fairgrounds. The OCARC club manned the OCCARO Ham Radio Booth on July 11th and August 5th. Dennis Kidder - W6DQ spoke again at our club's general meeting. 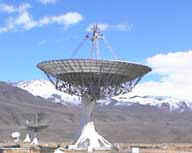 This time he spoke on Radio Astronomy, its history and the contributions of amateurs. Dennis showed us how you can do radio astronomy experiments with equipment you may already own. July's presentation was an appropriate topic for the International Year of Astronomy. The Orange County Fair runs from July 10 through August 9 of 2009 at the Costa Mesa Fairgrounds. The OCARC club manned the OCCARO Ham Radio Booth on July 11th. The Orange County ARC operated Field Day over the weekend from the Walter Knott School, Buena Park. Setup begain on Friday June 26th. Operations began at 11:00 AM local time on Saturday and continued until 11:00 AM on Sunday. Chip Margelli - K7JA of Heil Sound presented our June Program. Chip, in his dynamic entertaining manner, showed us the new Heil product line, as well as the classic favorites. Skip Freely - K6HMS was our May guest speaker. Telegraphy has a long history. Skip talked on "Telegraph Instruments — Keys, Bugs, Sideswipers, Paddles - Through the Years". Skip has a collection of over 200 telegraphic items; some he brought to show, and others he discussed. 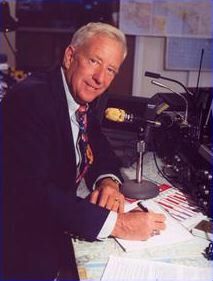 Skip is an old-time member of the club from the late 40's and early fifties. He also told us a lot about the old days in the club! This was an informative program on the history of telegraphic instruments. This Fullerton ARC event was attended by many of our members. It was held at the Tri-City Park in Placentia, starting at 10 AM. Activities included on-foot transmitter hunting, a lunch cookout and potluck. For more details see the April 2009 Issue of the Fullerton Radio Club Newsletter. Dennis Kidder - W6DQ, was our April guest speaker. Dennis, a very dynamic speaker, talked on time and frequency measurements. He displayed many items and photos of time and frequency standard equipment. A short 12 minute video of the Orange Police team's participation in the Baker to Vegas Race, featuring the amateur radio communications support, was also shown at the meeting. The video was shot and edited by former club member Mike Friese - KF6WRM. Jim Newcomb of Lido Mounts talked on the missing link between the mobile electronic device you purchased and enjoying that device in your vehicle. He showed and demonstrated numerous ‘no holes’ mounts for radio heads and microphones for cars and motorcycles. The Digital Communications DVD, originally scheduled for the March meeting, has been moved to a later date TBD. Many members of the OCARC supported the Orange City Police team at the annual 120 mile Baker-to-Vegas law enforcement relay race. OPD finished the grueling 120 mile foot race in 16:02:06 H:M:S, a very respectable time, to finish sixth in their class. The February general meeting guest speaker was John Haslett - KI6MCB, author of Voyage of the Manteño. John and his colleagues built a series of large balsa rafts similar to the Kon-Tiki. John told us of their adventures aboard the vessels. HF ham radio was their sole link to civilization and more than once a life-saver. John's book is available on Amazon.com. For those who missed getting a signed copy of John Haslett - KI6MCB's book Voyage of the Manteño, at the February meeting, unsigned copies are available through Amazon.com. At the January meeting Chip Margelli, K7JA presented the Russian-made video The Lost Islands, a documentary about a DX-pedition to several remote islands in the frozen Russian Arctic. In the days of the cold-war these islands were used as aerodromes for strategic bombers. Nuclear weapons were tested there, and missiles were test-launched. 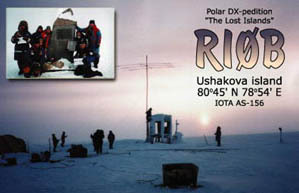 Using calls like RIØB and RSØB/P, this intrepid (and apparently well-financed) group of Russian DXers set up stations in some of the most foreboding terrain on the planet. It's a unique look at the human side of our Russian contemporaries, and this was surely a unique and interesting program to kick off the new year! Jan 10th*, Feb 7th, Mar 7th, Apr 4th, May 2nd Jun 6th, Jul 11th*, Aug 1st, Sep 12th*, Oct 3rd, Nov 7th and Dec 5th.